Our Freezer Bags from Handguards, Heritage Bag, Ziploc and Fantapak seal tight and work well in commercial freezers to keep the food from getting freezer burn and pack tight to maximize space. Clear bags make identification of the food easy. 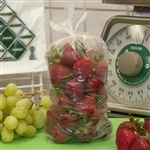 These Restaurant Supply Freezer Bags are strong and leak resistant for foodservice kitchens. Recloseable ziploc bags are the #1 selling freezer bag in America. 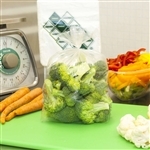 Handgards Freezer Storage Bag Clear - 4 in. x 2 in. x 8 in. 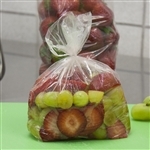 Handgards Freezer Storage Bag Clear - 4 in. x 2 in. x 12 in. Handgards Freezer Storage Bag Clear - 6 in. x 3 in. x 15 in. Handgards Freezer Storage Bag Clear - 8 in. x 4 in. x 18 in. Handgards Freezer Storage Bag Clear - 10 in. x 14 in. Handgards Freezer Storage Bag Clear - 12 in. x 18 in. Handgards Freezer Storage Bag Clear - 18 in. x 24 in. Handgards Freezer Storage Bag Clear - 6.5 in. x 9 in. High Density Freezer and Storage Bag Clear - 18 in. x 30 in. 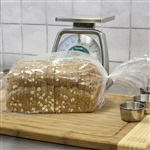 Buy your wholesale Clear Freezer Bags from the leader in restaurant supply. Butcher shops love these bags for long term storage.